Tired of people peeking through your glass doors to see if you’re home? Want to make your glass doors more secure from just anyone seeing inside? With adhesive-free decorative window film you can add privacy, security, and beauty with ease and little expense. Whether you want to just obscure a bad view while still letting in light, fully cover your glass, or just add a little flair to your door, static cling vinyl film has a design that is right for you. With partial privacy window film designs in etched glass, stained glass, or frosted colors you can obscure the view while still being able to see outside. Window film that has either a see-through background or see-through elements is great to accomplish this task. Etched glass designs such as Doral, Ritz, and Monte Carlo are white frosted films with see through elements which adds privacy while being able to peek outside. Stained glass designs such as Biscayne and Grapevine have see-through backgrounds, adding a dash of floral elegance to your glass. These designs still allow you to see outside while letting in softened light. If you’re looking for the most privacy and security a full coverage design would be right for you. A few of our etched glass films will go with any décor adding subtle elegance. Want to simply dress up a boring glass front door or French door? 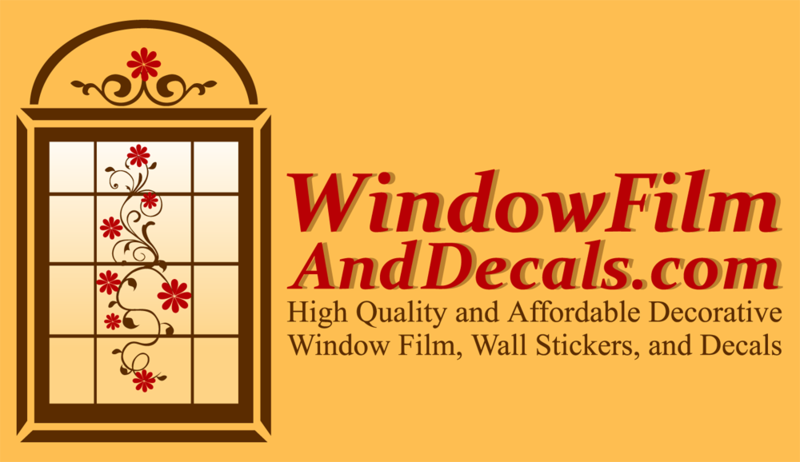 Try beautiful window film accents such as centerpieces, corners, and borders! You can make your doors unique and gorgeous by adding a simple centerpiece. Dress your door up a little more by including elegant corners or borders. The best thing about adhesive-free window film is that it is easy to apply and easy to remove. You don’t have to buy new doors, glass, or worry about ruining your glass as with adhesive window film. Adhesive-free window film is also reusable! Easy to trim and clean, you can’t go wrong with these static cling do-it-yourself window films.